16. Welcome in the future - What are forwards and futures? - Studfin - Einfache Geldanlage! "Saudi Arabia has the ability to exert a similar influence over oil by hedging its long-term production through the oil derivatives market. In other words, it should concurrently cut output and sell long-dated oil futures and related contracts." We talked about liquidity risk in the last blog entry, now I am going to show you how banks or companies can hedge liquidity risks. I will first explain interest rate forwards and futures, interest rate swaps and then credit default swaps. Believe me, it won't be as bad as it sounds right now. 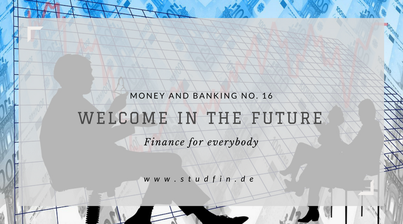 A bank has the option to borrow money now or in the future and therefore push the survival constraints into the future. The survival constraint is the point in time when someone has to settle the payment and is not satisfied with a promise to pay, an "I owe you" (IOU). If my friend lends me money, because I forgot my wallet, he probably wants to have it back soon. I can probably tell him for a week that I will repay my debt asap. At one point he will get mad and tell me to give him the 10 Dollar note tomorrow. This is when the survival constraint would hit me and I cannot push it further into the future. Now imagine a company knows that it needs money in three months for three months to buy a machine but is afraid that money will be tighter or interest rates will have changed. So the company decides to enter a forward rate agreement (FRA). A FRA is a contract that hedges interest rate risk, by locking in a rate for a certain amount today. This rate is based on the future spot rate. The spot rate is the rate of a treasury bill right now. As an example, a 3-month treasury bill pays 1% interest now and in three months it might rise to the future spot rate of 1.5%. Now the company can be certain that she has enough money to roll over debt for the next six months at a fixed rate. Forwards are contracts that are based on an underlying asset, usually on commodities. Imagine we have a farmer who only grows wheat. He needs to be certain that he can sell his wheat for a good price in the next fall. A bank or a dealer offers him to pay a certain amount for a certain volume. Usually, this price is a little bit lower than what he could get for it, if he would have just sold his wheat at the market in the next fall, but now he has the insurance that someone will buy this specific amount at a specific price next fall, which makes planning a lot easier. If the wheat price were lower than expected, the farmer would make a profit and if the price would fall the bank would make a profit. Futures are like forwards but there is not one settlement at the end of the contract but small settlements every day. I bet that the future price of the S+P Index is below 100$ and you say it will be above 100$(I know that the S+P Index is worth more), so at the end of the day the clearinghouse checks the price of the S+P and either I get money from you or you get money from me, because the index has risen or fallen. Future rate agreements are "bets" on the future interest rates and always one party has to pay the difference to the other party. Isn’t there an arbitrage opportunity, so the opportunity to earn money without taking a risk? The forward rate is usually higher than the future spot rate and the future spot rate is higher than the actual spot rate. Therefore, if I were a bank and could borrow money at the risk-free rate in the repo market, which is at 0.75% for three months and buy a treasury bill for six months that gives me a profit of 1%. Furthermore. I would also make a contract to borrow money in the repo market in three months for 0.8%. So I lend long (to the government buying a treasury bill) and borrow short (3-month borrowing in the repo market). Don't I make a risk free profit of around 0.225%? Not really because the bank locks in the money for six months and faces liquidity risk. The risk of not being able to roll over debt into the next period. Because the money is locked in for six months if the bank would have bought a treasury bill. In conclusion, a company or bank is able to borrow money in three months for three months and so the survivals constraint will not hit in the next six months because it is able to roll over debt. Someone can also enter a forward to hedge the risk of falling prices and to be able to plan. The forward contracts are always a good benchmark of futures prices unless unexpected things happen. If a bank has given away too many forwards or forwards rate agreements it can sell the FRA to speculative dealers that are willing to take the risk of interest rate movements but I will talk more about that in the next blog entry. Financial Times Article: If Saudi Arabia is selling future contracts it can hedge the risk of falling prices and is able to influence future prices.